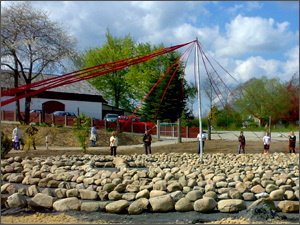 Our Trojaborg is a copy of a stone-lined labyrinth from the Bronze Age. 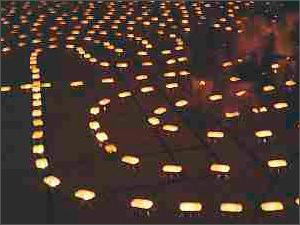 You walk all the way to the centre of the labyrinth, and the same way back out again. 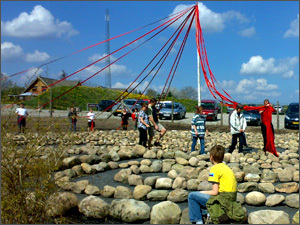 The Trojaborg labyrinth covers an area of 400 m². 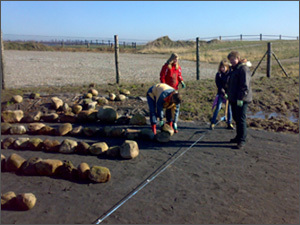 The total length of paths is 400 metres to the centre and 400 metres out again. 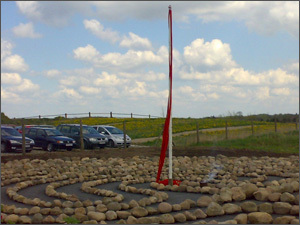 The stone-lined Trojaborg labyrinth has been known and used by human beings since the Bronze Age, (about 3-4000 years ago) and perhaps even longer. 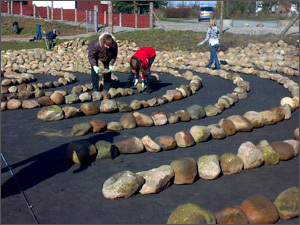 Although you cannot get lost in the Trojaborg labyrinth, it is filled with mystery and magic power. 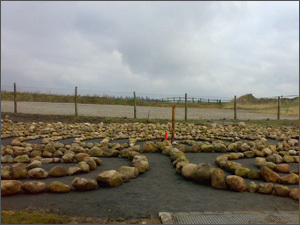 Come along and walk the Trojaborg labyrinth – perhaps you will find your own magic experience! 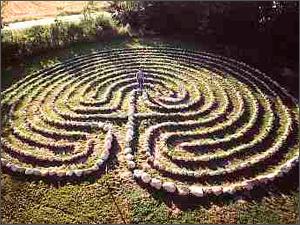 Please note: According to old local tradition, “It is important to follow the path of the labyrinth to the centre and out again. 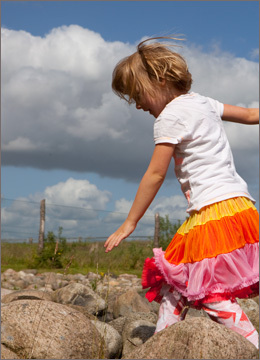 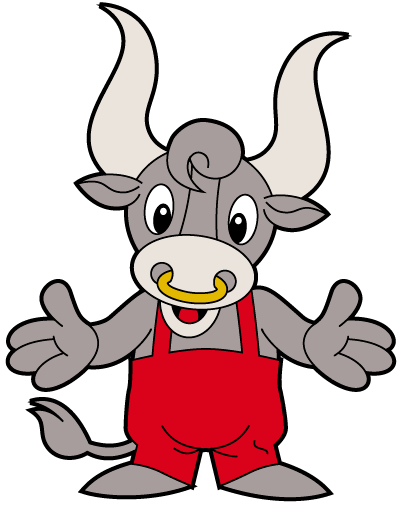 If you can manage this, it will bring good luck and success, but bad luck will follow if you jump over the stone walls”. 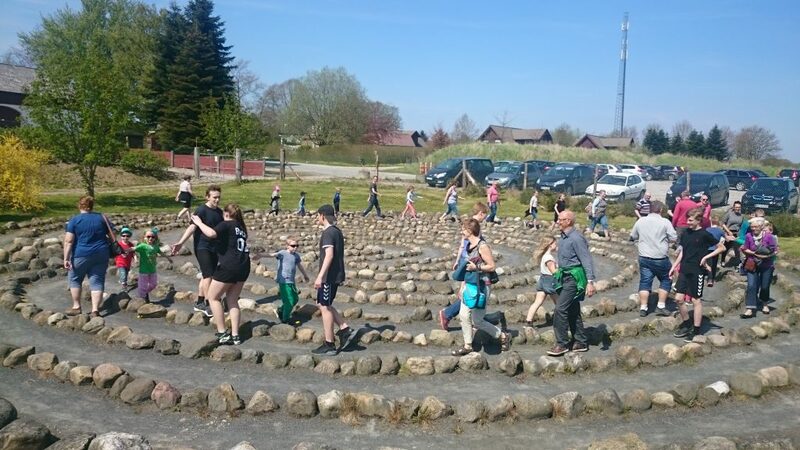 Discover the secret of the old Trojaborg labyrinths: You can learn more about them by reading the menu “History & Use” – “Trojaborg Labyrinths“, or by reading the displays “The History of the Labyrinths and Mazes” in the exhibition area at Labyrinthia (in Danish and English), or if you are a group of visitors by booking a lecture in advance (in Danish or English). 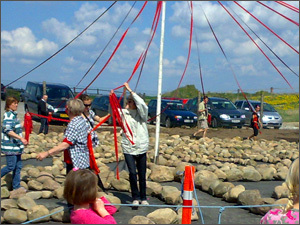 Scroll down and read more about the construction of our Trojaborg labyrinth. 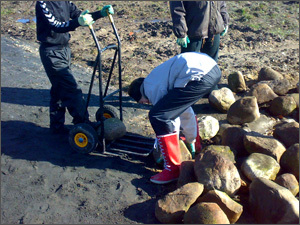 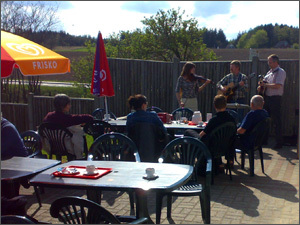 In 2008, we built a new copy of a stone-lined Trojaborg together with two 6th form classes from Frisholm School. 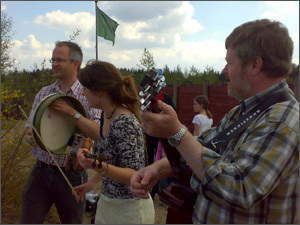 First we practiced with strawberry punnets at the school, and danced in a chain in the labyrinth, accompanied by Irish folk music. 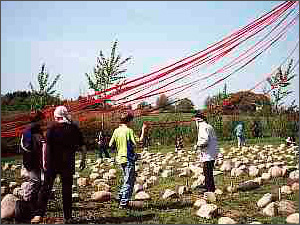 The 1st and 3rd April, we met on the field at Labyrinthia to build the Trojaborg labyrinth with boulders, placed on a bedding of black stone powder. 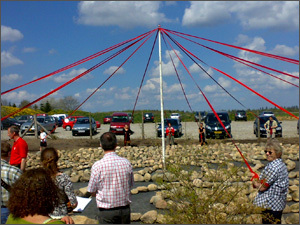 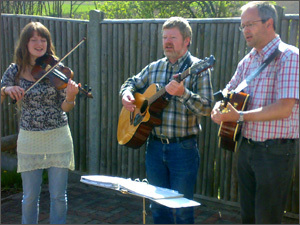 The official opening ceremony on May 3rd 2008 with a Maypole dance with red ribbons accompanied by a local group called “Irsk Stuvning” (Irish Stew). 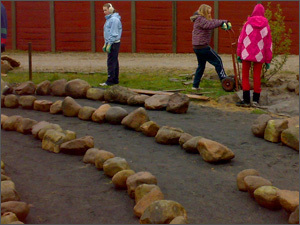 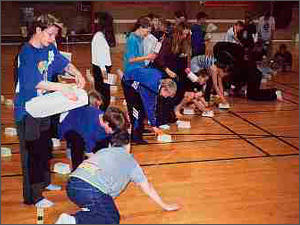 In 2000 we built a copy of a stone-lined Trojaborg labyrinth together with “Labyrinthologist” Jørgen Thordrup and the 6th form from Bryrup School. 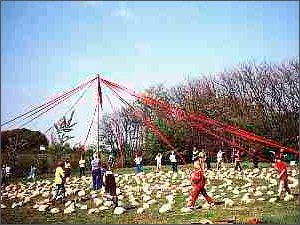 It has now been dismantled. 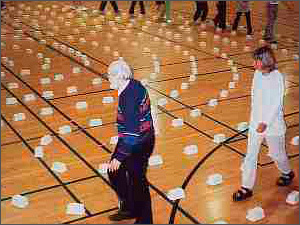 Then we lit the candles in all the strawberry punnets and switched off the electric light in the sports centre - isn´t that beautiful! 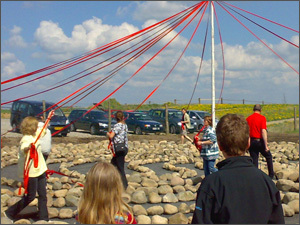 At the opening ceremony, we danced a Maypole dance with red ribbons. 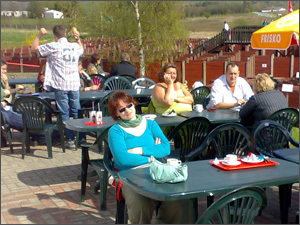 Here you see the final result!